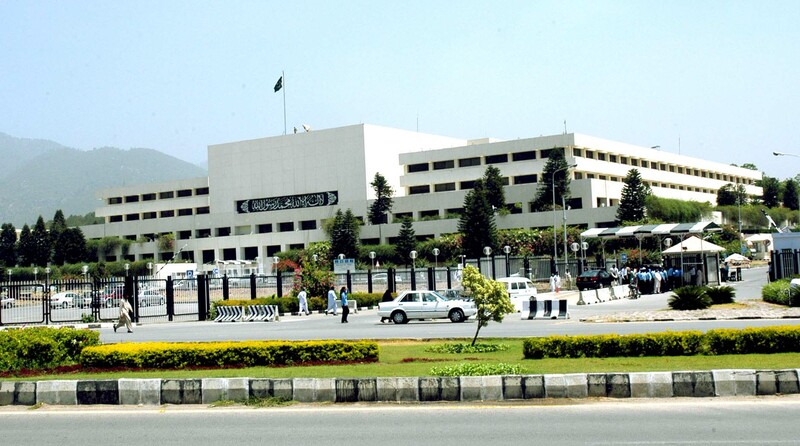 The Parliament House building in Islamabad was inaugurated on 28th May, 1986. It took exactly 11 years to build. It was designed by Edward Durel Stone, an architect from USA. The five storied building has a total floor space of about 598,000 sq. feet. The ground floor has a covered area of 176,889 sq. feet and houses the main foyer, restaurant, bank, dispensary, post and telegraph offices, PIA reservation office and a mosque on the ground floor to accommodate 450 Namazis. Directional sign-boards have been provided throughout the building to facilitate the movement of visitors. The first floor (total covered area 176,294 sq. feet) has offices of the Chairman and Deputy Chairman Senate and Chambers for Leader of the House and Leader of the Opposition in the Senate. This floor caters for offices of 14 Federal Ministers, Secretary Senate and senior officers of the Senate Secretariat. It also has three Committee Rooms, equipped with modem public address system. The Senators’ Services Centre, the Senate Library and the Cafeteria are also housed on this floor. The second floor has a covered area of 128,134 sq. feet. The National Assembly and the Senate Halls are situated on this floor. It also houses the chambers of the Prime Minister, Speaker and Deputy Speaker National Assembly and offices for 16 Ministers. The Library of the National Assembly and a Committee Room are also located on this floor. The third floor has a covered area of 58,012 sq. feet. Some offices of the Senate and the National Assembly Secretariat are set up on this level. The Press Lounge is also located on this floor. On the fourth floor are located the President’s Chamber, a Committee Room as well as the offices of the National Assembly Secretariat. It also houses camp offices of Press Information Department (PID), Associated Press of Pakistan (APP), Pakistan Press International (PPI), Pakistan Television (PTV) and Pakistan Broad Casting Corporation (PBC). The Senate Hall and the National Assembly Hall are situated back to back on the second floor and separated by a common area housing the lifts. The Senate Chamber has seating capacity for 124 Parliamentarians while the galleries can accommodate 353 persons. The Chamber is equipped with modem public address and Simultaneous Interpretation System (SIS) based on micro computer technology. A microphone, an earphone, loud speaker and seven-position channel selector switches have been provided for each member. The microphones can be operated both automatically and manually. A microcomputer Automatic Voting Counting System (AVC) and a large electronic display board have been installed in the Senate hall. Each member has been provided with a voting unit fixed on his table. However, rules have yet to be amended for the use of this facility. CCTV equipment is also installed. The National Assembly Hall is oblong in shape with a diameter of 130 feet. The main Chamber has seating capacity for 448 Parliamentarians. The hall is equipped with electronic boards and a sophisticated public address system. The hall ascends gradually in tiers. Flanking the hall on three sides of the circumference are seating areas for visitors which can accommodate 822 persons. Special areas have been designated for the guests of the President and the Speaker. A separate enclosure has been earmarked for members of the Press. A Post Office, PTCL Customers Services Centre as well as PIA and Railways counters are also located on the ground floor. Medical care is available for members in the Federal Government Services Hospital (Polyclinic). However, for emergencies or ailments requiring immediate medical attention, the services of a Medical Officer are available in the dispensary on the ground floor adjacent to the mosque. There are seven committee rooms in the Parliament Building five of which have SIS facility. Adequate fire fighting and smoke detection equipment has been provided in the Building. Staircase or exit points for use in case of emergency, like fire or non-functioning of lifts, are provided. Sign boards showing exits in case of emergency are prominently displayed in the building. The design of the building is such that the three upper floors are smaller in size than the two below. A terrace with plants and surfing runs around the perimeter at the second floor. There are four light wells, one at each corner of the building which reflects sun light into the building. The Parliament House is flanked on the North West by a terraced lawn which is spread in front of the Aiwan-e-Sadr. The front lawn of the Parliament building has a sizeable collection of trees planted by various foreign dignitaries, who visited Pakistan from time to time after the inauguration of Parliament Building in 1986.